St. Basil’s Cathedral marks 455th birthday. 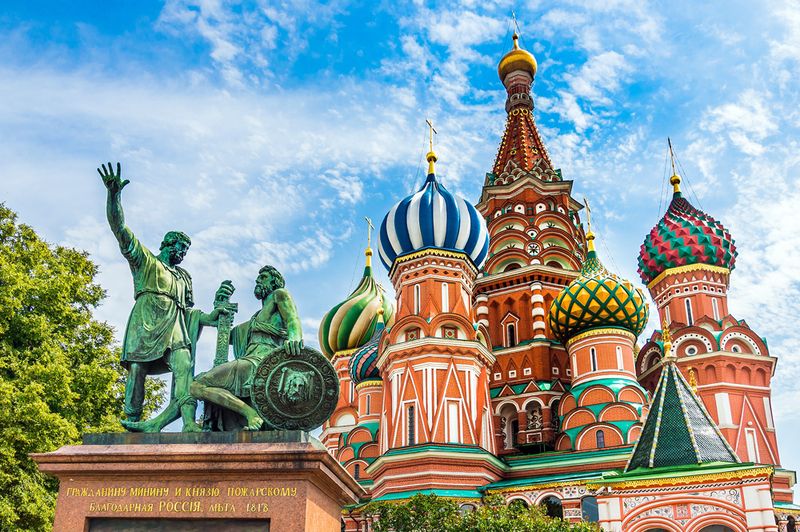 On July 12, one of Moscow’s best known and most photographed sights – St. Basil’s Cathedral – marks its 455th birthday. Here are eight interesting facts about the cathedral and its history that you may not know. 1. Its official name is the Cathedral of the Intercession of the Most Holy Theotokos on the Moat. The church in Red Square was built in 1555-1561 by order of Tsar Ivan the Terrible to commemorate his victory over the Kazan Khanate, which took place on the religious holiday of the Intercession of the Holy Virgin. The church was known as the Cathedral of the Intercession of the Holy Virgin on the Moat in reference to its location: Until 1813, the Kremlin was protected by a moat along the side of Red Square. Four of the cathedral’s eight chapels were named after religious holidays that coincided with the key events in the Kazan campaign. Another one is named after Saint Trinity: According to one theory, in the Middle Ages there was a Trinity Church on this spot. 2. The cathedral symbolizes the Heavenly City. According to one theory, the cathedral symbolizes Heavenly Jerusalem, in other words the Kingdom of God, whose walls are decorated with precious stones. According to another theory, its architects tried to replicate the Church of St. Mary of Blachernae in Constantinople, the scene of a miraculous intercession when the Holy Virgin appeared to Christians praying for protection from a Saracen army and covered the whole Christian world with her mantle. 3. It is actually nine churches in one. At first, the basement of the future cathedral served as a basis for nine small churches built one after another and connected with galleries and passageways. Interestingly, in the 16th century the basement was used to store the church coffers and savings of the city’s wealthy residents. The exterior of the cathedral was made to look like brickwork. Each era left its trace on the cathedral’s architecture. After a fire in 1595, the churches were decorated with onion domes, which acquired their present-day vivid colors only in the 18th century. In the late 17th century, a frieze telling the history of the cathedral was added and remained in place till the end of the 18th century. In 1817, during the renovation of Red Square, architect Joseph Bove reinforced the retaining wall of the cathedral with stone and erected a cast-iron fence. 4. The cathedral’s second name derives from a Moscow holy fool. The cathedral got its second name – after Basil the Blessed – for a reason. The Moscow holy fool Vasily (Basil) could see into the future and predicted the fire of 1547, in which nearly a third of Moscow was destroyed. Throughout his life, Basil suffered privations, was homeless and wore no clothes or shoes irrespective of the weather. When he died, Metropolitan of Moscow Macarius conducted his funeral, while Ivan the Terrible himself acted as a pallbearer, together with other boyars. After Basil was canonized in 1588, a 10th church was added to the cathedral to house his relics, and the whole ensemble was named after Basil the Blessed. 5. The architects of the cathedral were blinded. There are several theories as to who designed the cathedral. The most widely accepted one is that the cathedral was designed by architects Barma and Postnik. The legend has it that Ivan the Terrible ordered that the architects be blinded after they completed work on this beautiful cathedral so that they could not replicate or surpass it elsewhere. Yet this is unlikely to be more than a legend since Postnik was later involved in building the Annunciation Cathedral, as well as the walls and towers of the Kazan Kremlin. According to another theory, the Cathedral of the Intercession may have been built by an Italian architect who was working in the Moscow Kremlin. 6. The French wanted to blow it up, while the Communist authorities wanted to demolish it. This cathedral, situated in the heart of Moscow, has been in mortal danger more than once. In 1812, when the French troops were retreating from Moscow, they wanted to blow St. Basil’s Cathedral up but did not have time to do it. 7. Only one original bell remains. The cathedral’s belfry is still operational. However, out of all the multitude of bells it has had since the cathedral was built in the 16th century, only one has survived to the present day. In 1929, the Soviet authorities ordered that the bronze bells be melted down and, according to bell ringer Alexei Konovalov, it was by a miracle that one bell survived: “It has preserved the sound of the 16th century, down to the last upper partial tone,” he said. 8. It is a world heritage site. The Cathedral of the Intercession was one of the first to come under the ownership of the young Soviet state. In 1923, it was converted into a museum of history and architecture, and in 1929 it became a branch of the State Historical Museum. In the early 1990s, the cathedral, including the Chapel of Basil the Blessed, once again began to be used for religious services. In 1990, it became part of a UNESCO World Heritage Site.